"Yanukovych kaput! Wow," Ola, 18, shouted when her friend ran over to show the news on his phone that Ukrainian president Viktor Yanukovych had fled Kiev. She jumped up and down, pumped her fist in the air, and spun around. It was about 4pm local time on Saturday (22 February) and she was standing in the rain outside a large, burnt out, military building on the outskirts of the city centre in Lviv, western Ukraine. She had been making soup in a tent for a handful of cadets guarding the compound. Misha, one of the guards, smiled. When asked by EUobserver whether he was loyal to Yanukovych, he said that he was loyal to "the army." When asked who the army was loyal to, he said "the generals." When asked who the generals were loyal to, he walked away. He had no gun because the guns, an estimated 12,000 small arms, had been looted by protesters three days ago. Nobody in Lviv could say where they were. Ola was cooking for Misha because local soldiers are not hated in Lviv. When they got the order last week to go to Kiev to help crush protests, they first SMS-ed their parents, who came with crowds to block the gates of their compound. They did not resist when the barricades went up, or when the guns were taken away. The building caught fire largely by accident, from burning tyres by the gate. People in the city centre also reacted to the Yanukovych news with pride. Valentyna, 40, an economist, spoke to this website outside a vandalised and abandoned police headquarters. 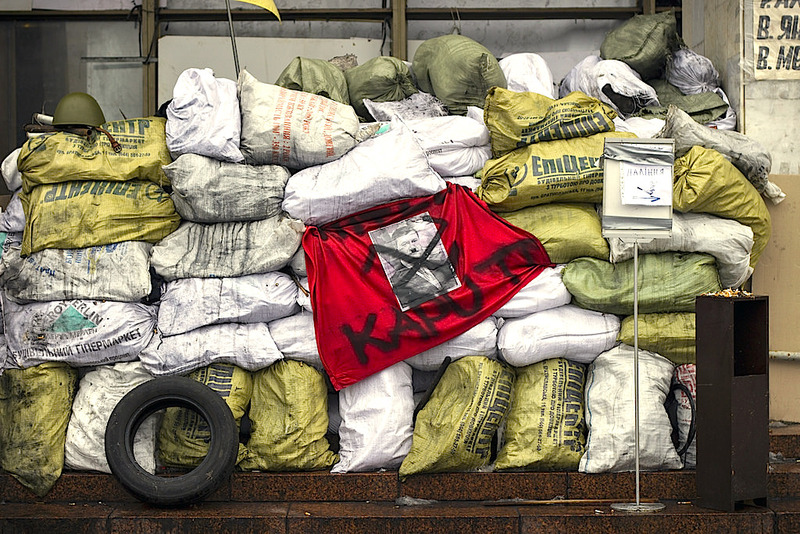 "The people who fought and died on the Maidan [the main square in Kiev] are idealists. 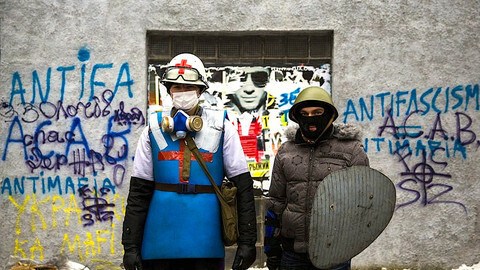 Nobody believed that Ukraine is a country of people who are ready to die for ideals. Who in Europe would be willing to do this?," she said. 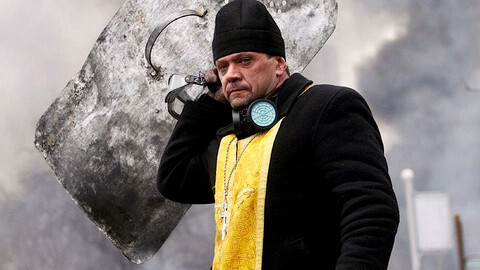 "Slava Ukraina! 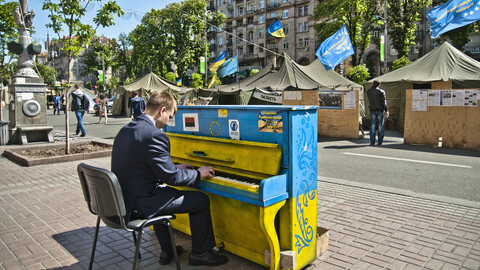 ", she added - a revolutionary slogan that means "Glory be to Ukraine". She said that Europe had "insulted" the Ukrainian opposition. "People stood on the Maidan for three months and Europe did nothing. Now it should block their [the Yanukovych government's] bank accounts. 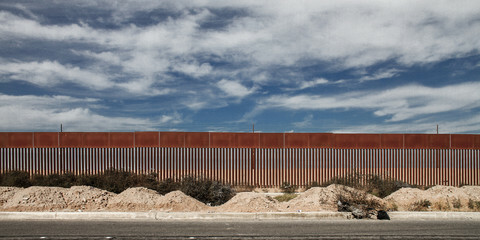 It should work with the new authorities on this, because most of them have put their stolen money in Europe," she said. At a square in Lviv's old town, people gave speeches on a stage and milled around. Here, the news from Kiev was confusing. Some reports said Yanukovych had formally resigned and gone to Dubai. 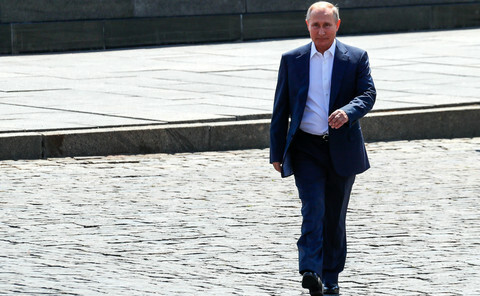 Others said he had gone to Sochi, in Russia, to meet Russian leader Vladimir Putin to plan a military intervention after the winter Olympics ended on Sunday. Others still said he had gone to Kharkiv, in eastern Ukraine, to meet jailed former prime minister Yulia Tymoshenko to negotiate a power-sharing deal. Artem, 41, a former businessman, now a local commander for the Pravyi Sektor, a militant opposition group, said that he would not support Tymoshenko or any other opposition MPs, such as Arseniy Yatsenyuk, Vitali Klitschko or Oleh Tiahnybok. "They are all part of the same corrupt system that we are trying to overthrow. They all co-operated with the bandits. This is not about Euro-integration. This is about ending the system of banditry," he said. Stepan, 71, a retired engineer, agreed. When asked by EUobserver who he supported, he pointed to the teenage boys in military-type clothes outside the Pravyi Sektor tent. "Only the young people can build something new," he said. Stepan also voiced anger at European politicians. "They don't care about us. They didn't care about us when the Soviets were carting us off to Siberia in meat wagons and they don't care about us now," he said. In other parts of Ukraine on Saturday, people were pulling down statues of Lenin. In Crimea, some members of the local assembly called for Russian troops to enter Ukraine to protect Russian passport holders from disorder, however. Meanwhile, in Kiev itself, events galloped forward. Earlier on Friday, three EU foreign ministers - from France, Germany, and Poland - had brokered a deal between Yanukovych and some opposition leaders that would have seen him stay in power until new elections at the end of the year. The crowds on the Maidan, where snipers had gunned down dozens of protesters, rejected the deal and threatened to march on Yanukovych's palace, however. 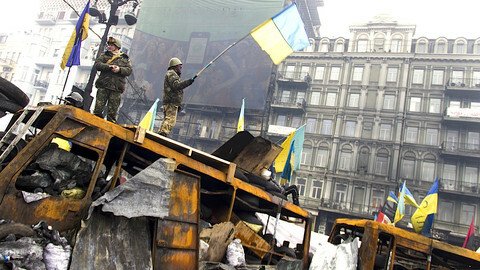 On Saturday, Yanukovych left the capital and his security forces said they were standing down. 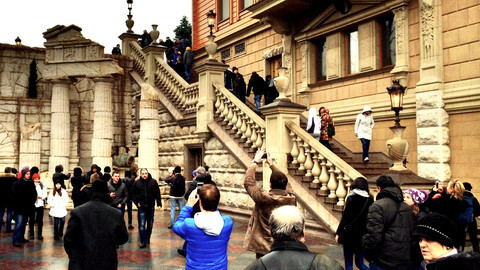 Protesters occupied the palace and Yanukovych's private mansion, the Mezhyhirya complex. MPs from his ruling Party of Regions also defected en masse. In an extraordinary session of parliament, the Verkhovana Rada, MPs installed Oleksandr Turchynov, a Tymoshenko loyalist, as interim leader and called snap elections in May. 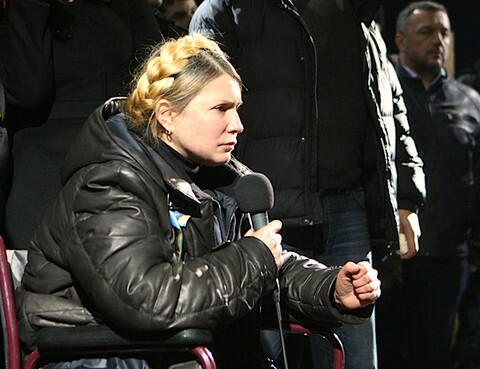 They also freed Tymoshenko, who left a prison hospital in Kharkiv, after two and a half years in detention, and who flew to Kiev to speak at the Maidan from a wheelchair. "Until you finish this job and until we travel all the way, nobody has the right to leave … You have the right to rule this country," she told the crowd. For his part, Yanukovych, in a TV statement recorded at an undisclosed location, described the events as a "coup d'etat … a repeat of the 1930s when Nazis came to power in Germany and Austria." He added: "They are trying to scare me. I have no intention of leaving the country. I am not going to resign. I'm the legitimately elected President … I will do everything to protect my country from breakup, to stop bloodshed." The Russian foreign ministry echoed his words. It said the opposition was "submitting itself to armed extremists and looters whose actions pose a direct threat to the sovereignty and constitutional order of Ukraine." Amid concern that Ukraine, a country of 46 million people which transits Russian gas to the EU, could break into two or more parts, the EU published a statement. "The European Union expects everyone in Ukraine to behave responsibly with a view to protect the unity, sovereignty, independence, and territorial integrity of the country. I call on everyone to abide by the rule of the law and the constitution," EU foreign affairs chief Catherine Ashton said. Radek Sikorski, the Polish foreign minister who took part in Friday's talks in Kiev, tweeted: "No coup in Kiev. Gov. buildings got abandoned." Swedish foreign minister Carl Bildt said: "Now confirmed that president Yanukovych tried to get the army as well to move against protesters … but was stopped." Back in Lviv, the city, home to 800,000 people, settled down to a quiet night on Saturday. With no police, the streets were patrolled by groups of five or six men, some wearing yellow vests or carrying self-made ID badges with their photos and the legend Samo-Obrona, meaning "Self-Defence" - the name of the volunteer squads formed in the past few days. Sales of alcohol had been banned after 6PM to prevent public disorder, prompting bars and restaurants to close early and the streets to go quiet after dark. Many shops also put posters in the windows that displayed an open palm against a balaklava-clad face and which said: "Anarchists. Stop! Do not destroy your own city". On the roads leading into Lviv, informal checkpoints, made from burning tyres and manned, for the most part, by teenage boys, stopped and checked cars. 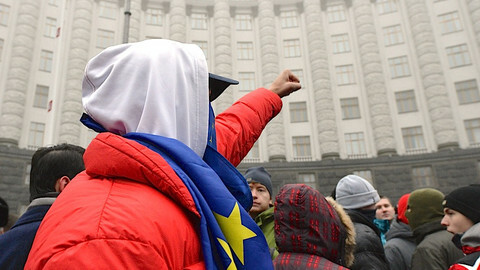 They told EUobserver that they were looking for "titushki," government-hired thugs who had attacked people and property in several cities in recent weeks in order to intimidate the opposition. On Sunday morning, thousands of people plan to get on free busses to Staryj Sambir, a village near the Polish border, for the funeral of Bohdan Solchanyk, a local history teacher and Maidan protester, who was shot in Kiev last Thursday. One of his friends, Svitlana, 23, who works as a children's entertainer, told EUobserver that she was not scared about the future. "I'm optimistic. Maybe it's just my nature. Or maybe it's because I'm from Lviv. Everybody knows everybody else here and we will take care of each other no matter what happens," she said. "So many people have died, so it can't be for nothing. Things must change for the better now," she said. A deal in Kiev promises to end an outbreak of violence, which has seen over 75 people killed in the past few days. The EU’s language of “concern” has worn thin on the cold streets of Kiev: People need a promise of accession and practical help for genuine reform. People who came to St. Mikolaj's church in western Ukraine on Sunday heard an appeal for national unity instead of recriminations against the east. With Yanukovych on the run after allegedly stealing billions and causing scores of deaths, opposition chiefs want EU sanctions, but the Union is not ready.